Despite the cold, the grey and the bitter east wind, I headed out to the Erme valley over Easter. This part of the moor is very little visited and has few paths shown on the map, just the usual high moorland maze of sheep tracks meandering over the slopes. 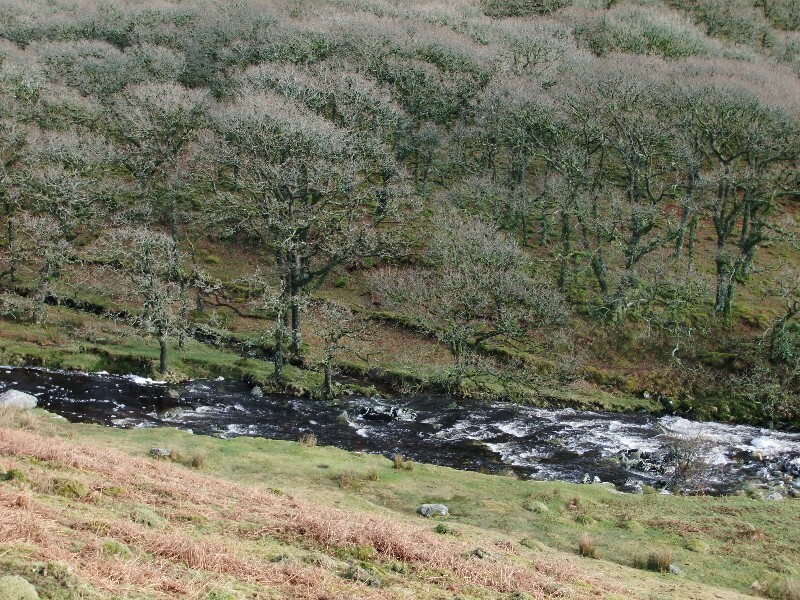 But this wild and barren area not only features masses of Bronze Age remains, it also has a gem of ancient woodland tucked along the eastern bank of the river – one of three on Dartmoor, the other two being Wistman’s Wood and Black-a-Tor copse. Four thousand years ago, the Erme valley would have been a lively place. On both sides are villages, pounds and homesteads. High above are stone rows, burial cairns and barrows. The longest stone row on the moor (and probably the longest in the world, as rows of this kind have not been found anywhere else) is further up on the western side. 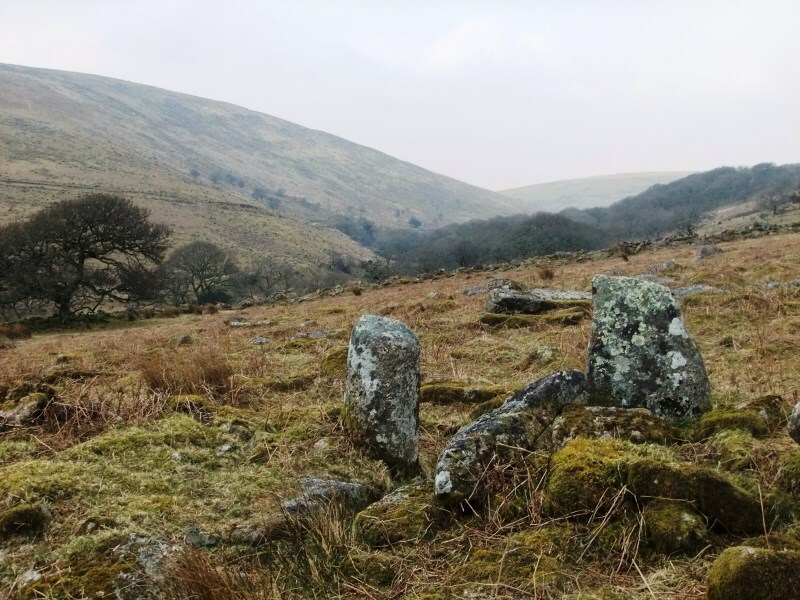 The second longest stone row starts on Piles Hill, above the woodland, and runs for 2 kms to Butterdon Hill. More stone rows and cairns dot the ridges – Bronze Age people put ceremonial and burial sites above their settlements, and it is believed that all the nearby communities would gather there on special occasions. As you walk up the valley, it feels like walking into the past. A couple of hundred metres from the car park, you leave the fencing behind and see just open moor with a speck of woodland ahead and traces of circular pounds on the slopes over the river. On the way upstream, you pass the remains of numerous hut circles and prehistoric reaves (field boundaries) but no trace of modernity. And then, after a mile or so, the trees begin, the path runs down alongside the Erme, and there’s the sound of rushing water and birdsong. It is a magical spot. 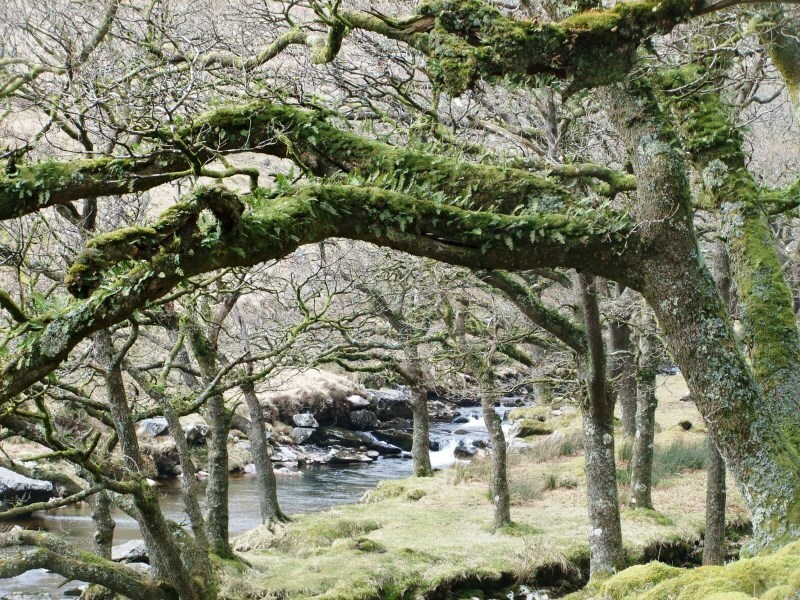 The oak trees are larger than those in Wistman’s Wood and less contorted – they are sheltered from the worst of the wind by the steep slope above – but they have the same mosses, ferns and lichen growing on them and the same moss-covered boulders on the woodland floor. 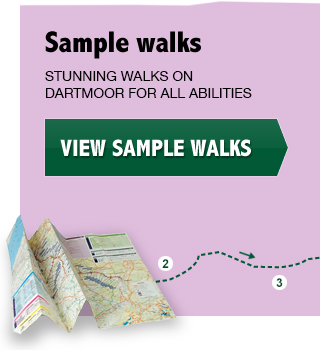 The path avoids the boulders by following the river, and at the end of the wood it’s possible to climb up to the top of the valley at Piles Hill and follow the stone row southwards back towards Butterdon Hill. The views from up here are spectacular – although on Easter Monday it was hard to even stand up, let alone appreciate the view. 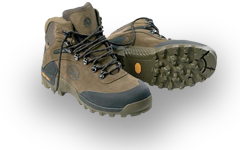 I’m hoping for less wild weather on April 21 when the Erme walk is scheduled.